Speaking at the White House on Monday, Trump tried his best (and failed) to muster up moral outrage over the entirely unproven, alleged "chemical attack" in Douma, Syria. Trump is a terrible liar. Does he want us to know he's lying to signal his hand is being forced? What the hell is going on here? 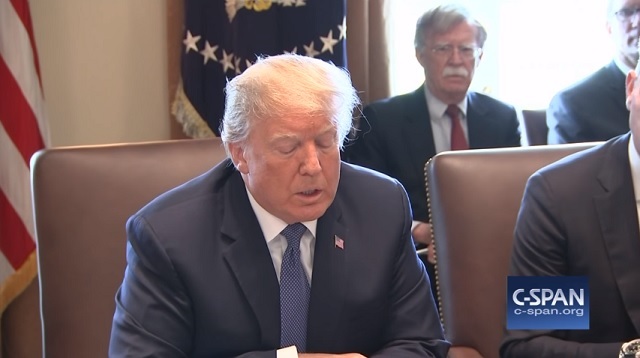 Watching John Bolton peering over Trump's shoulder his first day on the job as Trump reads off a script pushing for war is also creepy as hell. I�d like to begin by condemning the heinous attack on innocent Syrians with banned chemical weapons. It was an atrocious attack. It was horrible. You don�t see things like that. As bad as the news is around the world, you just don�t see those images. There's horrible stuff like this happening every day. The media only shows these horrible images if they want to con the masses into a war. 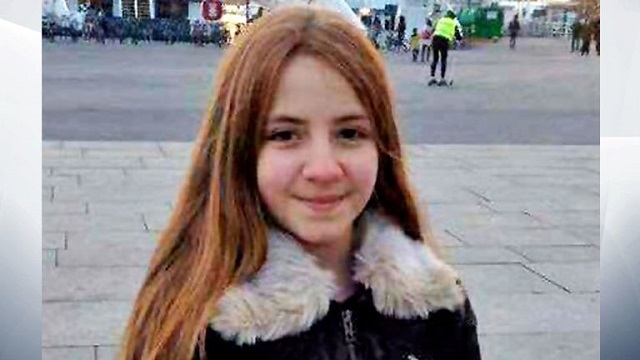 When Muslim terrorists run over people with trucks and splatter children's bodies all over the street as happened recently with 11-year-old Ebba �kerlund, they censor the images and hide them from the public. When attacks happen in Syria and the media wants war they show graphic, uncensored images for everyone to see. Their agenda couldn't be any more transparent. We are studying that situation extremely closely. We are meeting with our military and everybody else, and we�ll be making some major decisions over the next 24 to 48 hours. We are very concerned when a thing like that can happen. This is about humanity. We�re talking about humanity. And it can�t be allowed to happen. How many Americans have been killed by Mexicans in the last 10 years vs. Americans killed by Syrians? Think of the children (just not the ones we've killed in our endless wars in the Middle East, we hide those from the public)! So we�ll be looking at that barbaric act and studying what�s going on. We�re trying to get people in there. As you know, it�s been surrounded. So it�s very hard to get people in because not only has it been hit, it�s been surrounded. And if they�re innocent, why aren�t they allowing people to go in and prove? Because as you know, they�re claiming they didn�t make the attack. They let Russia in and they said there's no evidence of any chemical attack. 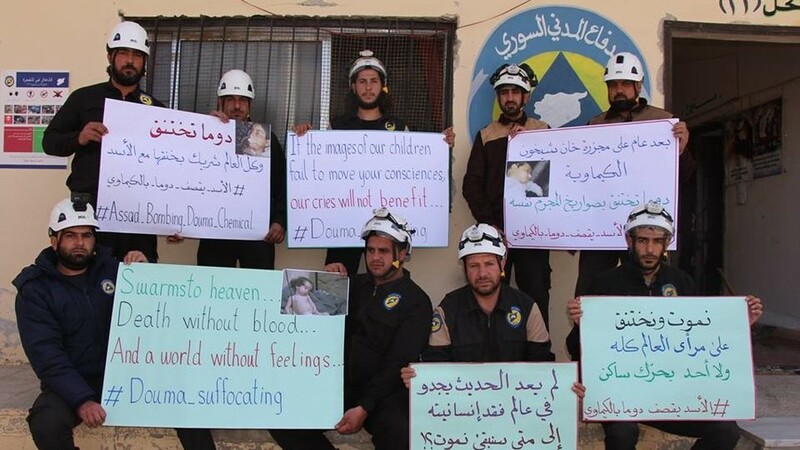 The "White Helmets" group claiming there was an attack are a pro-intervention activist group. So if it�s Russia, if it�s Syria, if it�s Iran, if it�s all of them together, we�ll figure it out and we�ll know the answers quite soon. So we�re looking at that very, very strongly and very seriously. Yeah, I'm sure Russia, Syria and Iran all got together to decide to gas a bunch of children just before the war is over while the President of America is openly musing about pulling out of the area. You�re President of Syria, civil war starts, you nearly lose. But now you are about to win. Only one thing can go wrong, international intervention happening only if you use chemical weapons. You use chemical weapons. This is so transparent and fraudulent it boggles the mind.